Manage your private book collection and comfortable on your computer. Select the desired book from different Internet databases a�� high resolution cover picture inclusive a�� simply by entering title, author, publisher or by scanning the barcode EAN / ISBN. Electronics books as PDF-files, so-called eBooks, can be managed too. full text search, grouped list-view, assignment of filters, categories, print, online-reviews, quotations, backup etc. Bucharchiv is offered in different Editions. Choose one Edition which is most suitable to your needs for an optimal working, e.g. manage a private book collection at one computer with the Standard-Edition, access to one (password-protected) database from three computers or the professional usage in a public library (Enterprise-Edition). 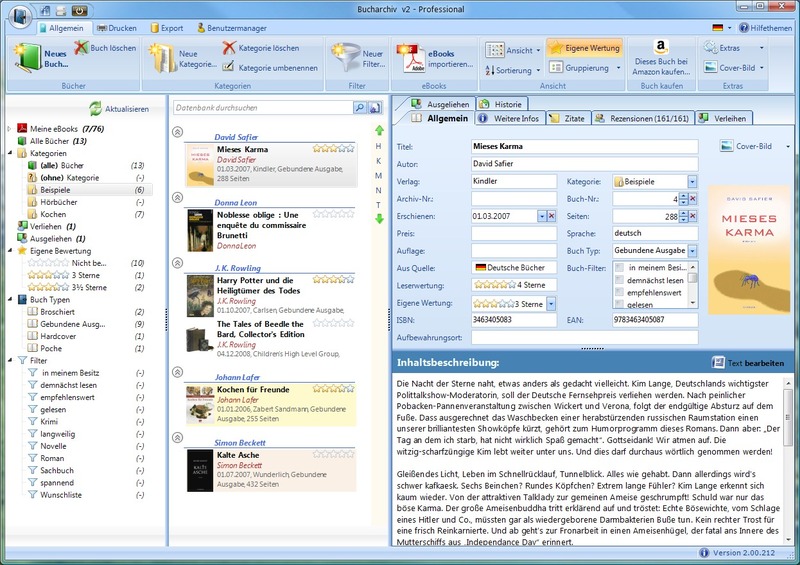 With Bucharchiv you can manage your private book collection or library easy and comfortable on your computer. You need only a few seconds to find a book in the extensive Internet databases. Enter title, author, publisher or EAN / ISBN-number by your barcode scanner and you get the results inclusive high resolution cover pictures. It's also possible to add a custom existing file of the cover picture. For that, Bucharchiv is an excellent tool to inquire for book-titles. Qweas is providing links to Bucharchiv V2 2.00.252 as a courtesy, and makes no representations regarding Bucharchiv V2 or any other applications or any information related thereto. Any questions, complaints or claims regarding this application Bucharchiv V2 2.00.252 must be directed to the appropriate software vendor. You may click the publisher link of Bucharchiv V2 on the top of this page to get more details about the vendor.